Picking a waffle maker is not always an easy task. There are just so many different types available! Some are designed to make thick Belgian waffles, other make thin and crispy ones, and some can make both. There are a few which even have a corrugated and a flat surface, so you can fry an egg and make your waffle at the same time. What we do recommend is to avoid any waffle maker that claims to be able to make both thin and thick waffles. Although they may seem like a versatile machine, they usually don’t work so well. If you’d like to prepare both styles, it’s better to get two machines, one for each. The best waffle maker distributes the heat evenly across the plate’s surface. The last thing you need is to end up with a waffle that is cooked unevenly, with crunchy and soggy parts. Another feature to check is if you are able to control the iron’s temperature since not all batters cook at the same rate. If you only have one temperature, some batters will over cook, and some will under cook. If the iron has any separate browning options, it is one you should really consider. Another useful feature is having a non-stick coating. You want your waffle to slide out of the iron when it’s done and not having to scrape it off. Some waffle makers have a “done” indicator that lets you know when it is ready by either beeping or turning on a LED. A timer is also a great feature. The All-Clad will make perfect waffles every time. You can use plain batter or include fruit in it; this waffle maker will cook it perfectly. Waffles made by this iron are crunchy on the edges and soft on the inside. This is achieved by the way the machine releases the steam through a ventilation opening at the top, instead of it covering your waffle and making it soggy. There is a browning dial with seven settings that let you select the level of crispiness you want. And you can do other things while your waffles are cooking, the machine will let you know when it is ready by beeping and turning on a LED. No need to keep opening the lid to check how your waffles are doing. 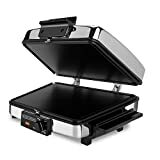 It features a completely non-stick surface and makes waffles that are about 6.5 inches in diameter by 1/2-inch thick, with four easy-cut sections. The Waring WMK600 is quite similar to the All-Clad maker. It also features a browning control, LED and beeping indicators and non-stick coated waffle grids. There is no steam ventilation, but this machine is designed in such a way that there is no steam build up. Your waffles come out perfectly cooked. 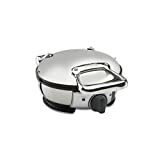 The waffle maker has two round-shaped waffle plates with a rotating function. This is to achieve even baking, and you can make two Belgian waffles at a time. The Presto FlipSide is a great option to bake extra-thick Belgian style waffles using a restaurant-style rotating design. Very easy to use: first, pre-heat the waffle maker. When the red light goes out, it’s ready to bake. Pour a cup of prepared batter into the waffle grid. Then, set the digital timer for four minutes. Close the cover and rotate it 180 degrees. Rotating the waffle maker spread the batter evenly across the grids, assuring a perfect waffle every time. Make delicious waffles from packet mixes, or from scratch, using recipes like those found in the instruction manual. Choose from classic, fluffy, healthy, whole grain, scrumptious pecan, and decadent chocolate waffles. When the baking time is complete the machine will start beeping; open the cover and you’re ready to enjoy a delicious waffle that’s crispy on the outside, with a fluffy, tender inside. And waffles remove with ease; thanks to the non-stick grids, sticky waffles are a thing of the past. These delightful waffles are seven inches in diameter and divide easily into four easy to cut sections. The brushed stainless steel exterior provides both beauty and durability, and the non-stick interior grids are easily wiped clean. Storage is simple too, just rotate to the vertical position and flip the storage latch to lock it uprights, for space-saving convenience. This unit comes with several removable plates. Changing them is simple; there is a button on the side that allows you to lift up the plate and remove it to put another one. The round plate can be used for pancakes, sausage patties, or you can actually fit a whole egg or egg batter to make egg sandwiches in the morning. Put in the waffle grid and you are ready for your favorite waffles to be done. The waffle maker has a niche arched handle on the front which makes it easy to lift. The surface is all stainless steel. When you turn the unit on the red power light goes on and will let you know it’s operational. It has six temperature options, and once it reaches the one you’ve selected, a green light will light on to indicate that you can put your batter in and let your waffles bake. The waffle maker will beep when your waffle is ready. Black & Decker is always innovating. 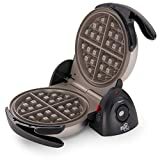 The Black & Decker 3-in-1 Waffle Maker give you the option to choose: the classic press gives you space for up to four perfectly cooked waffles. If you flip the plates around you now have a flat press, perfect for sandwiches, steaks and more. And if you lay the lid down it will create a full griddle to make eggs, bacon, and flapjacks to go with those waffles. When you’re done, just remove the places for unbelievable easy cleaning.